Just a short drive from Chapel St Leonards and Skegness, Hillview Lakes is described as a secret hideaway on the edge of the Lincolnshire countryside, a charming venue to get away from it all to enjoy a relaxing holiday. Located in serene surroundings, the privately-owned holiday park is situated in 26 acres of parkland, and with a lake and three ponds it’s ideally equipped to cater for even the fussiest of fishing enthusiasts. 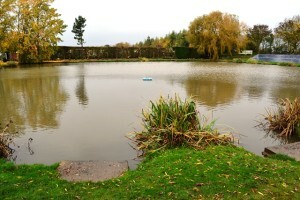 When the owner of the park, Kevin Palmer, needed to tackle the deteriorating condition of one of these ponds his extensive research led him to an ideal and surprisingly strong product. Kevin takes up the story: “The pond in question had been excavated 34 years ago and was starting to show signs of age, with the embankments having eroded over time and starting to become unsafe. “As we couldn’t make the pond any bigger I knew we’d have to take action to repair the banks and put it right, so I started looking at piling on the internet. “Initially I considered sheet piling but after some deliberation I decided that it probably wouldn’t be strong enough for our needs. “When I came across tubular pile I was very interested. I got two samples to look at it, one a hexagonal design and the other Liniar’s log pile. Kevin placed an order for 200 linear metres of Liniar log pile and began preparations to begin the project. The first challenge he faced was what would be the best way to install it. “Because we would be pushing the piling down into heavy clay I devised a vibrating plate to attach to the arm of a digger to drive them down gradually. This worked really well but it soon became obvious that the log pile was far stronger that we first anticipated and the plate wasn’t really necessary. Once all of the log pile was in place, Kevin took extra measures to ensure that there would be no natural movement in the future and the new embankments would stay in situ. 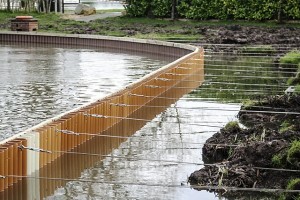 “We attached a retaining rail to the outer side of the pile and, using turn buckle tensioners every couple of metres along the perimeter, anchored stainless steel cable to galvanised steel stakes between eight and 10 feet back from the pond. With the project set to become an on-going one incorporating the other two ponds and the course fishing lake, which is three times bigger than the completed pond, Kevin couldn’t be happier that he chose Liniar log pile. “It’s a fantastic product, we’re delighted with it! It was so much stronger than we ever thought possible, enabling us to apply a lot of pressure during installation. And because of the way it’s designed we’ve been able to fashion some lovely sweeping curves along the embankment and create an interesting shape, rather than just straight edges. 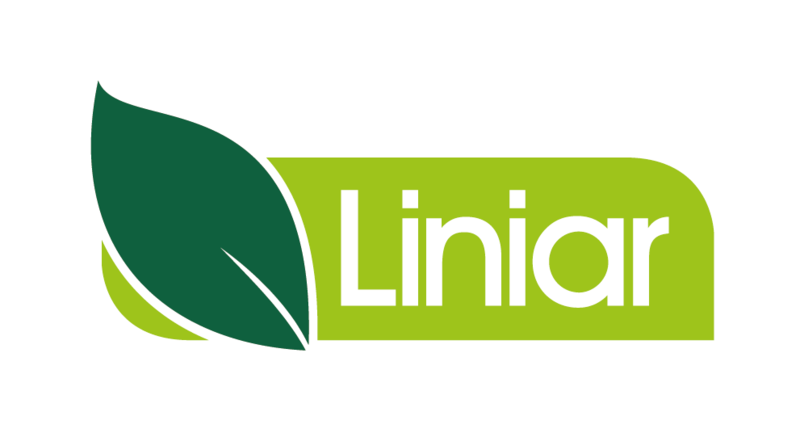 Manufactured from 100% recycled uPVC, Liniar log piling doesn’t rot or rust, is resistant to rodent and marine borer attack and is unaffected by the majority of chemicals. Neither does it leach chemicals into the water, therefore causing no harm to the natural habitat. It’s lighter than steel, so easier to handle and transport, and can be easily cut or bored. For more information on Liniar log piling click here or call 01332 883900.